But this is the exact attention to detail Berti Coltellerie give their knives, handcrafted in Italy since 1895. Each knife in their beautiful collection is handmade from a single artisan in the family workshop located in a small village north of Florence. It’s such a personal experience that every time you hold a Berti knife, you can almost feel the soul of the skilled artisan who made it. The choice for professional chefs and home cooks, those who are lucky enough to own a Berti Coltellerie knife will enjoy the superior cutting edge of the high carbon stainless steel and ergonomic handles that make chopping, slicing and dicing a breeze. With a matching carving knife and fork, this Lucite Carving Set will lend some Italian elegance to your next roast dinner. 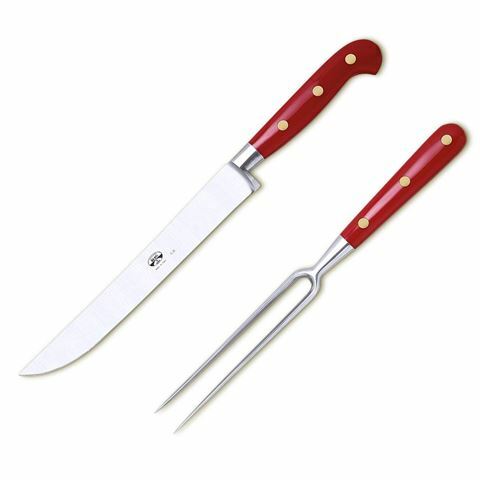 Both the knife and fork feature an anchored tang, while the handles are made from red-coloured lucite, and allow for a comfortable carving experience. Presented in a wooden storage box, this exquisite Lucite Carving Set will serve you well for years to come. Handmade from a single Artisan in Italy. Blade made from high carbon stainless steel. Blades are engraved with the initials of the artisan who made them. Anchored tang, with handles made from red-coloured lucite. Beautifully presented in a wooden storage box. Lucite Carving Fork - 29.5cm. Lucite Carving Knife - 36cm. Wooden Storage Box - 39cm (l) x 12.5cm (w) x 6cm (h).